The outlook for a special needs parent that fell in a hole. Seriously, this graphic, I didn’t make it – I found it on facebook, (if you created it or know who did, please comment and let me know so I can give them credit.) but anyway, this graphic says so much about what the Special Needs Parent goes thru for their child. In some cases daily, weekly, monthly and yearly. We see it many times for our David. And truth is, for some of the supports he has received over the years, the only reason he has received them is this blog and the fear some feel that I might sue the state of North Dakota over the lack of services and support. So where is this wonderful graphic? A Special Needs Parent Fell in a Hole. Boss: Oh that’s a shame. You can take the day off. Doctor: Can you keep a diary of your experiences in the hole? DBHDD: We will assess the size of the hole. However it make take up to 18 months. Local Authority: Sorry, we don’t have enough money for a ladder. Charity: Here is a form. Fill it in to get on the waiting list for a ladder. Another Special Needs Parent: I’m here! I’m coming down there with you. I’ve been here before. I know how to get out and I won’t let you do it alone. 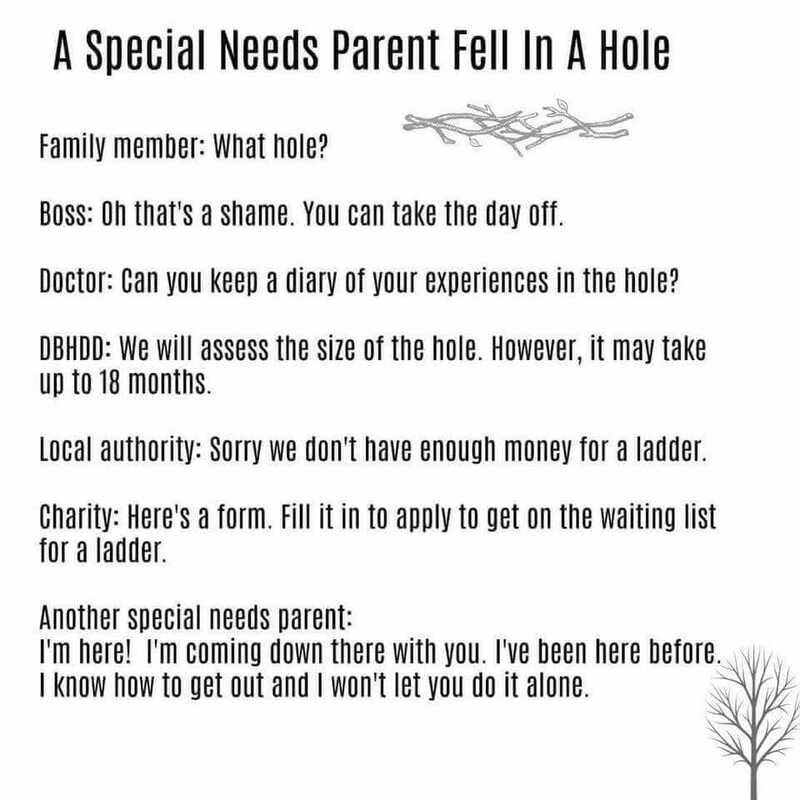 So if you are a special needs parent of any kind, whether you have helped someone yet or not. Thank you. We can’t do it alone. Offer to cook a meal. Offer a cup of coffee. If you know the child, offer an hour of respite so that mom or dad can have a few minutes to shower without tending to an emergency. Above all, don’t judge them for how neat their house isn’t.